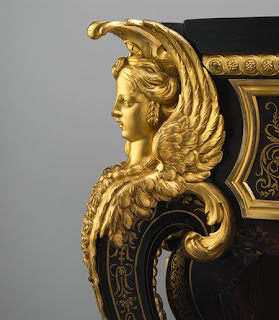 This commode ( Antique bombe chest) is of the same design and construction as the pair that was made by Boulle for the bedchamber of Louis XIV at the Grand Trianon in 1708. 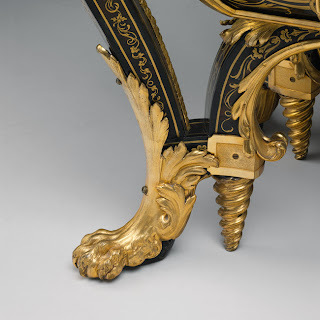 Although this model was copied a number of times during the eighteenth and nineteenth centuries, this example appears to be an early version made in Boulle's own workshop. 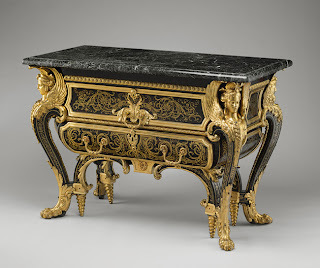 Appointed to the ébéniste du roi (royal cabinetmaker) in 1672, Boulle did not invent but perfected the marquetry technique of brass and tortoiseshell that has been named for him. So-called Boulle work is created by glueing together sheets of tortoiseshell and brass which are then cut according to the desired design. Once cut, the layers can be combined to form either a tortoiseshell ground inlaid with engraved brass or a brass ground inlaid with tortoiseshell, known as first part and counterpart respectively. 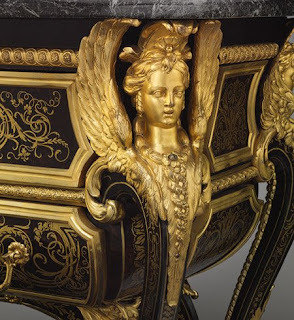 André-Charles Boulle was one of the first cabinetmakers to make effective use of gilt-bronze mounts. The mounts not only protect vulnerable parts of the carcass but also add a great deal of sculptural beauty to the piece. The three-dimensional acanthus-leaf scroll mount on the upper drawer beautifully echoes the two-dimensional design in the brass and tortoiseshell marquetry. Particularly noteworthy are the female figures at the corners, with their feathery matted wings contrasting with their highly burnished faces. 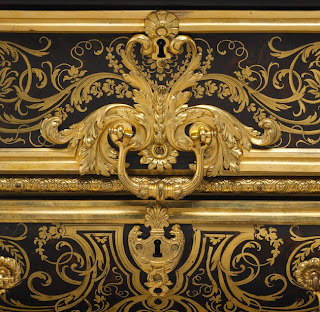 This has to be on of the most incredibly beautiful pieces of Boulle furniture that I have ever seen! I want it!!! !